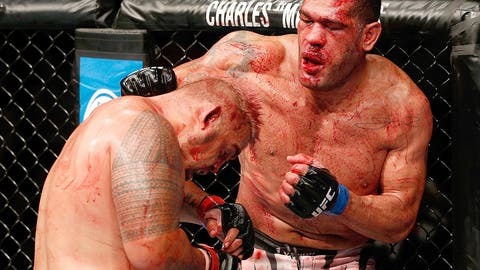 'Bigfoot' Silva became the most recent case of TRT abuse. Dr. Robert Klapper compares modern medicine to the infant stages of flight. The Wright Brothers, he explains, weren’t the first ones to fly. They were the first ones to fly - and be able to land. Others before them got a plane off the ground, but never lived to tell the tale. Klapper, who is Anderson Silva’s orthopedic surgeon, gave Fox Sports this analogy when talking about testosterone replacement therapy (TRT). There’s little doubt it can help those who say they need it, Klapper said, but what are the long term effects? It’s impossible to know. My fear is that these things could allow you to lose the typical stop gaps that the body creates - pain, swelling, limited motion. "I think it’s dangerous," Klapper said. "I think it’s not good for the athlete in the long run." TRT was a huge topic of conversation in MMA this year. Vitor Belfort was the poster boy. He went 3-0 this year with three devastating knockouts and is next in line for a UFC middleweight title shot. All of this was done while getting a testosterone usage exemption (TUE). The latest case was Antonio ‘Bigfoot’ Silva failing a test due to elevated testosterone levels following his epic draw with Mark Hunt earlier this month in Australia. Silva, who was on TRT, blamed a doctor for telling him he could take more testosterone close to the fight because his levels were low. ‘Bigfoot,’ who was pummeled for five rounds in a bloody war, was stripped of his $50,000 win bonus. Klapper speculated he might have been able to take that kind of beating because of the drugs. High-profile fighters like Chael Sonnen, Dan Henderson and Frank Mir have all admitted to using TRT, which is legal within certain commissions when a doctor says a competitor has a low natural level of testosterone. But Belfort has gotten the brunt of the criticism, because of his sheer dominance since being on TRT and the fact that all three of his wins this year came in Brazil, where the testing procedures are reportedly more lax. Plus, Belfort failed a drug test after beating Henderson in PRIDE back in 2006. The Nevada State Athletic Commission doesn’t grant TRT exemptions to fighters who have done performance-enhancing drugs in the past. If you’ve abused illegal substances like steroids, your testosterone level has a chance to drop. That’s not a legitimate reason to let a fighter take more drugs. "Why do some of these big strong guys have low testosterone? " Klapper said. "First question has to be, is it a side effect of what they have done in the past?" The TRT issue isn’t going away any time soon and could be an even bigger deal in 2014 if and when Belfort gets a title shot. Where he gets it will be the big question. This trend isn’t exclusive to 2013, but UFC president Dana White’s head almost exploded after UFC 167. The Las Vegas judges gave Georges St-Pierre a split decision win over Johny Hendricks last month when many people - including White - thought Hendricks did enough to win. GSP’s face was a disaster afterward and Hendricks didn’t have a mark on him. UFC Hall of Famer Matt Hughes called that the worst decision in UFC history. Honestly, it might not have been the worst one of 2013. While they weren’t as high profile, Max Holloway was robbed of a win against Dennis Bermudez in May and Francis Carmont had no business coming out ahead on the cards against Lorenz Larkin in April. Then there was Lyoto Machida getting a win stolen from him against Phil Davis in August. Plus, many people think Jon Jones should have lost the decision to Alexander Gustafsson back in September. Same thing with Benson Henderson’s title defense against Gilbert Melendez back in April. No, it’s not a performance-enhancing drug. But weed is still illegal in most states and with every athletic commission. Still, a handful of fighters tested positive for pot use in 2013, none more prominent than Pat Healy’s $130,000 blunt back in April. Healy beat Jim Miller at UFC 157. It was the Fight of the Night and Submission of the Night. And he had to forfeit every penny of those bonuses when he was busted. C’mon, Pat. We’re sure it felt great at the time, but was it worth it? Matt Riddle was cut by the UFC in March, because he couldn’t stop failing drug tests. And Alex ‘Bruce Leeroy’ Caceres also was suspended in March for marijuana use. Can you believe getting caught smoking marijuana was a big deal in 2013 and neither of the Diaz brothers were involved? Impossible. What do Jon Fitch and Yushin Okami have in common? They were two of the best fighters in the world in their respective divisions for a very long time. They were also both cut by the UFC in 2013. There was little doubt that Fitch was a top-10 welterweight and Okami was likely one of the top-five middleweights. But they were let go to make room for other fighters on the roster. Their larger pay scale probably didn’t help them; neither did plodding fighting styles. The UFC also declined to sign free agent Ben Askren, despite him being one of the best welterweights in the world. Askren can be difficult to watch sometimes with his wrestling-heavy style. He holds guys down for five rounds straight. Yet it’s hard to dispute that he’s one of the best guys out there. Exciting fighters put butts in the seats, no doubt. But MMA is still a sport. There’s something to be said for winning. Otherwise, what’s the point?